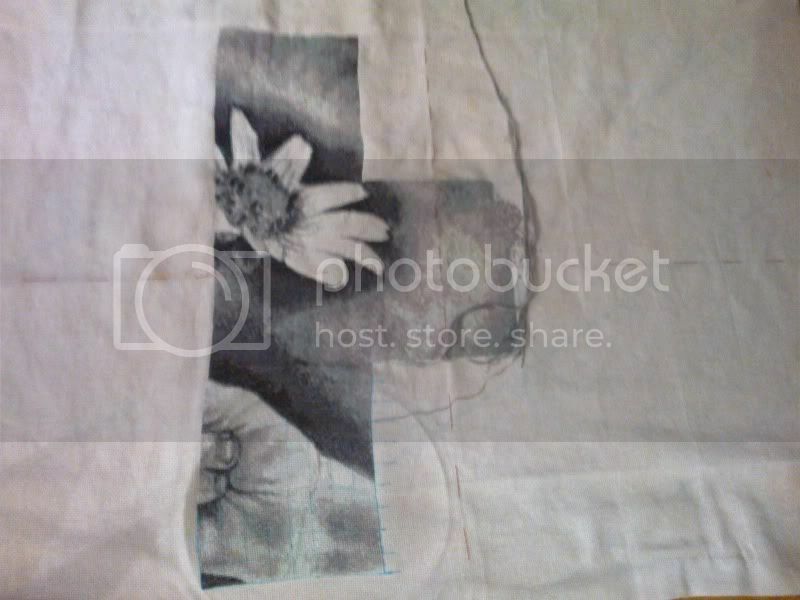 This is my progress on HAED Daisy Offerings by Sandra Kuck...I am on Page 2 out of 36 pages. 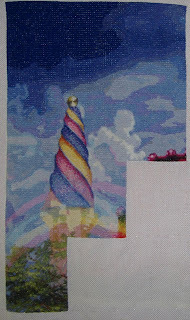 I have two more rows to go and than this page will be finished. Her Hairline is going real slow because it is a different color in every square. I am doing the Hairline first before I do the rest of the Page. 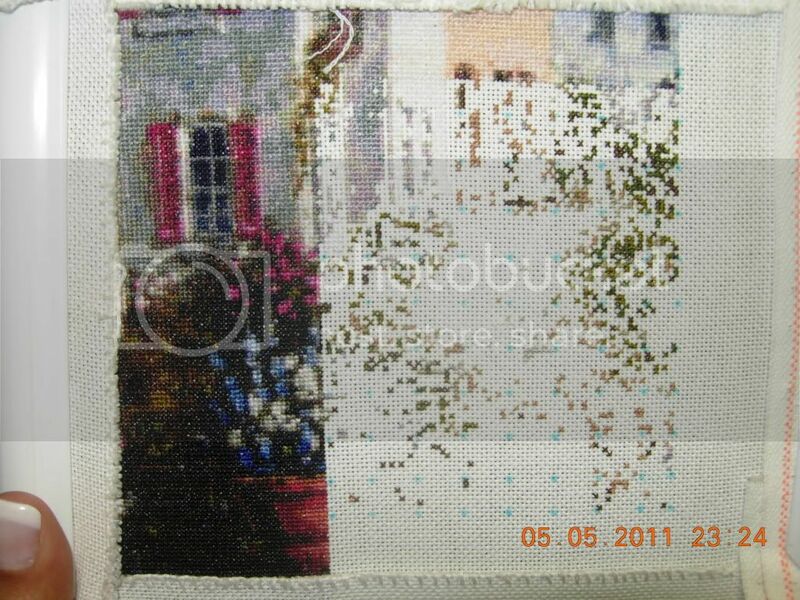 I am stitching this on 25 Count Potato Lugana 1 over 1. 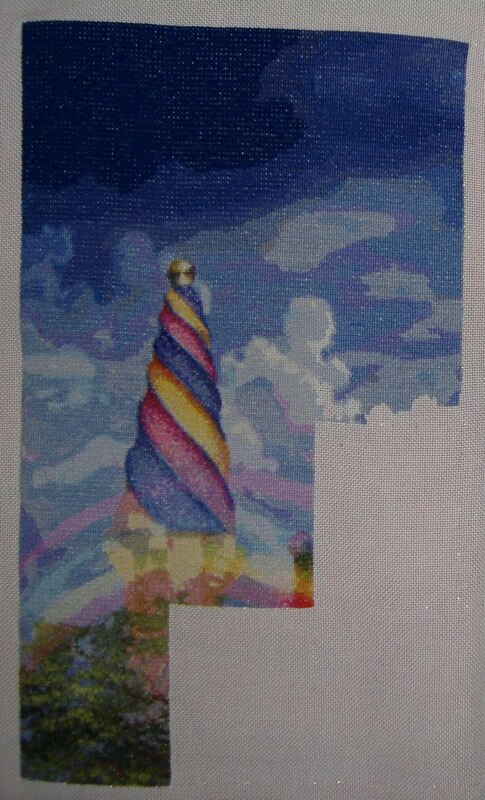 My Progress as of today, Mon, May 30, 2011. 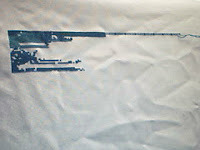 I thought I would also show a close up picture of this as well as the whole view. 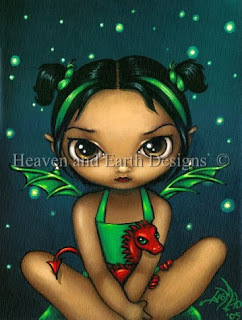 Well guys, here she is...... Faces of Faery 141 is TOTALLY FINISHED!!! I think she came out stunning, much bigger than I reckoned for but still beautiful! 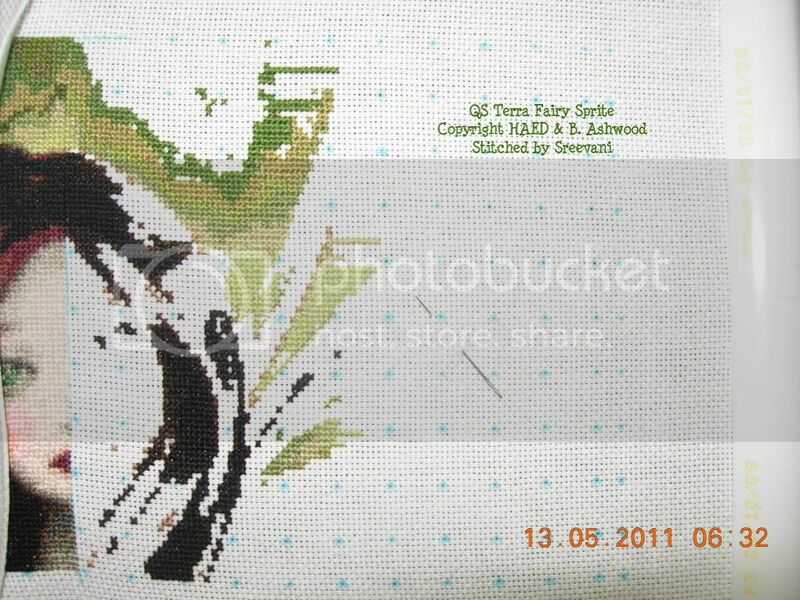 I will definately stitch another Face Of Faery in the future as I loved the way this one stitched up on the 22 count hardanger! Now it'a back to TT A Pale Comparison that only has one page left to go so the next post will probably be another finish!!! WAAAHHAAAY!! I am really pleased how the first page turned out, and am looking forward to seeing her face on the next page, but i am now on another Haed, Nene Thomas's Corsair Deamira this week, which is a new start so no before picture. 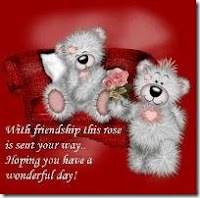 This post is for my buddy Connie! 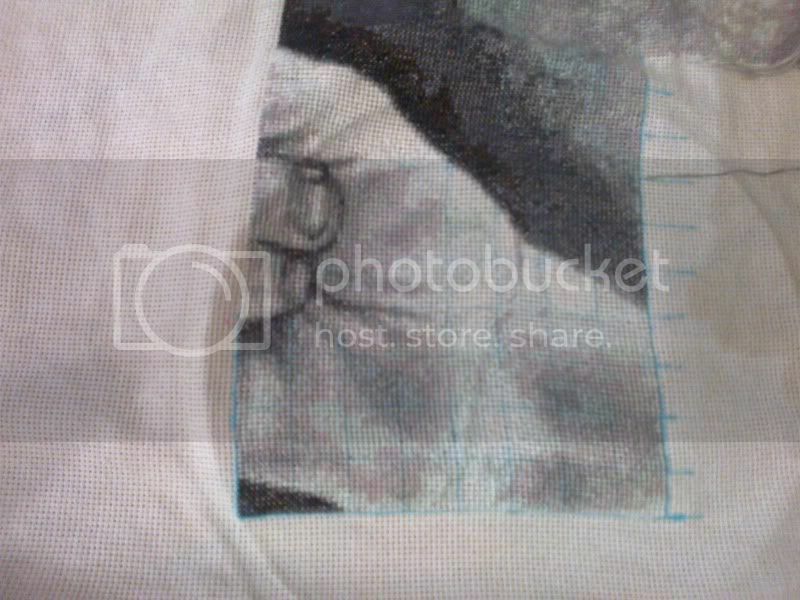 She is stitching her first HAED 'Angel of Mine' by Zindy Nielsen. "I took a picture finally even though it is just background. It is stitched on hardanger fabric 22 count 2 over 1 full crosses... I think I have 2 more rows of 10 of background then I finally start the wings." Here's the latest updates for my buddy, Vani!! 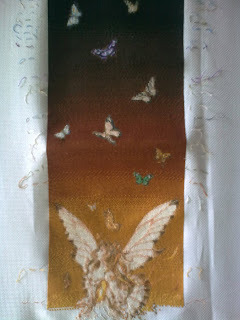 Its been a long time, I had some good times of stitching and some lulls due to life being busy! Here's what I've been up to since my last update. 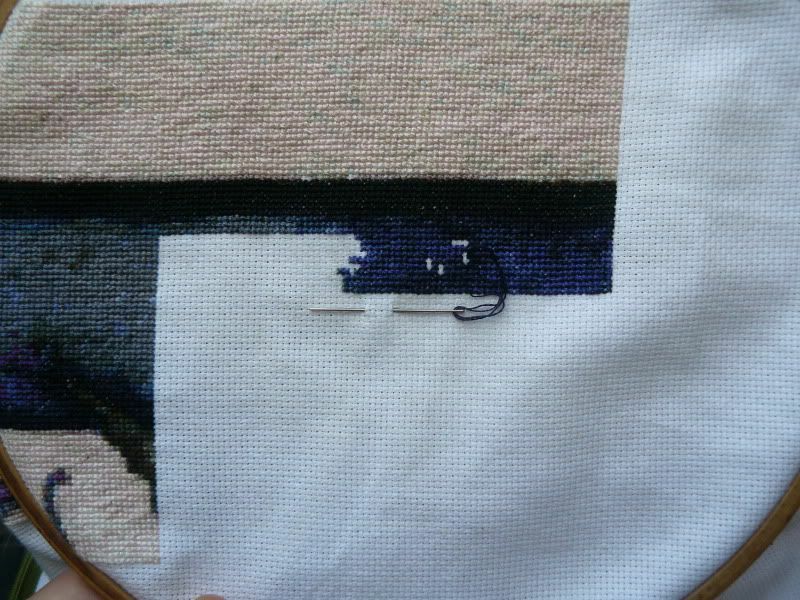 Hello all, it's been a while but I have some (little) progress on my Bottom of the Garden. I hope to get the 3th page finished by the end of June, but I'm not sure about it. 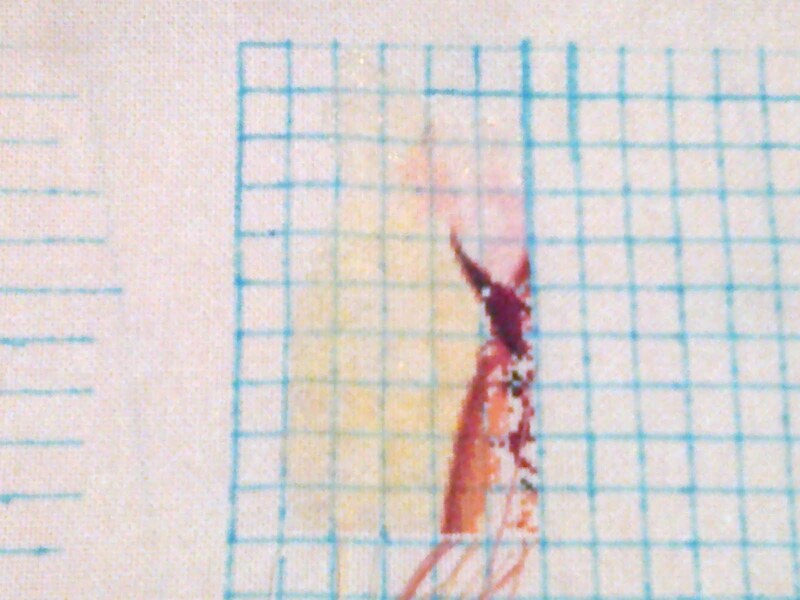 This page has a little part of the wings in it, so that means a lot of confetti stitching. 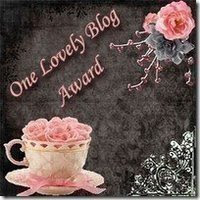 I love the progress on all of your works, but unfortenatly Blogger isn't letting me post comments. I hope it gets fixed soon. SK Dragon Luck ~ finished! And I've finally finished page 9 of Gaudí. And the roof of the house showed up too! :) Now it's gonna rest for a week. Here's the latest update on Faces Of Faery 141. 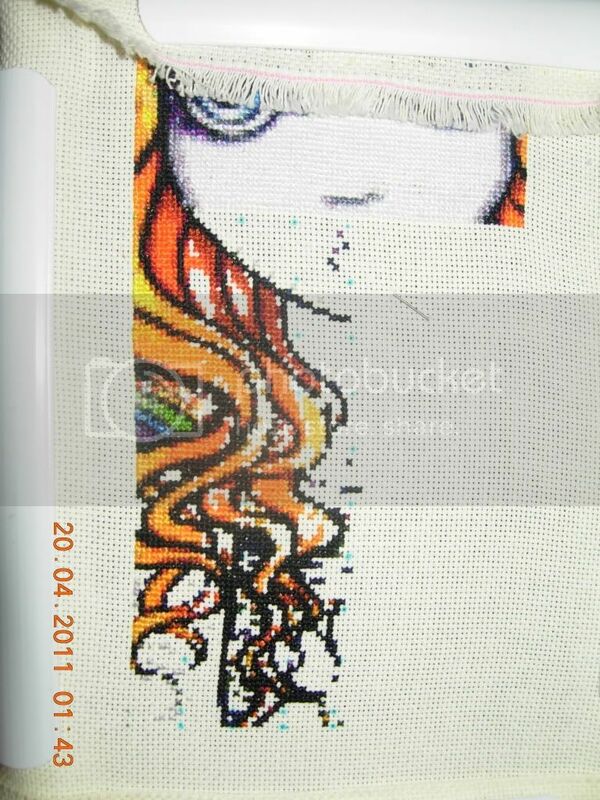 She's absolutely flying now as I can't physically do much else but stitch at the moment. One more page and she'll be finished.... can't wait!! Well here she is.................. excuse the hoop ring and the blue grids lines as I won't be removing them until she's finished now! I'll be back soon with a finish!!! 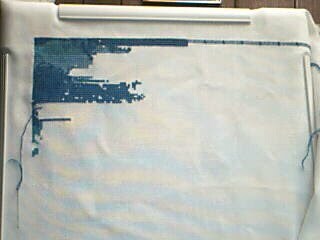 I just finished the 14th page this afternoon...I have also done some of the 15th page as I don't like to form a line of stitches at the edge of pages...the next page is more interesting with more colours in it, we will see what it looks like...that's if I can drag myself off facebook! Note to self, less time on computer...more time stitching! A small article to show you my progress on Green Dragonling for May. I haven't made much progress since April. I finished my second page and started my third page. 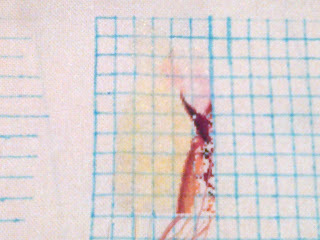 with this new page, I stitch the design's background. This is not the most motivating part but at least there isn't much confetti stitch ! 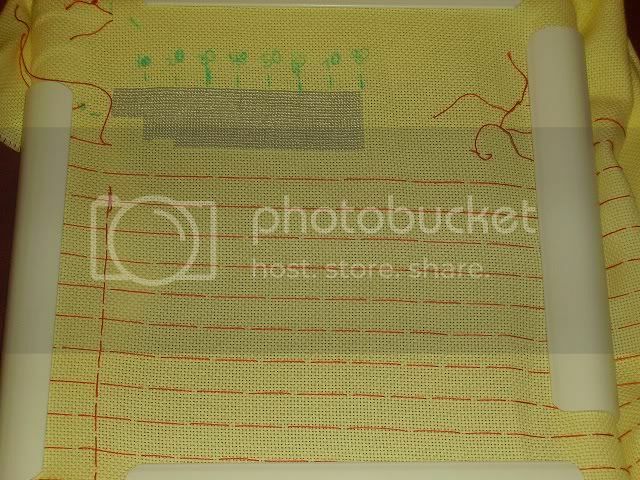 I've managed to do 10 200 stitches so far ! 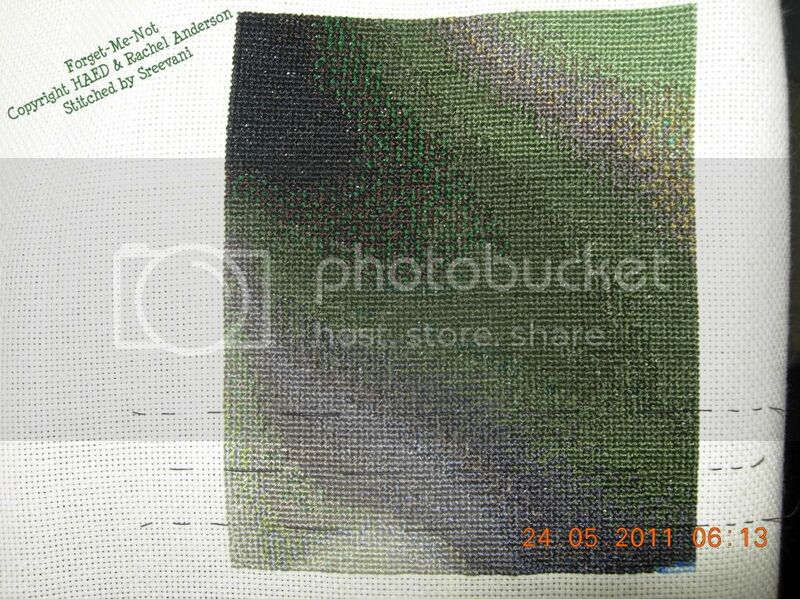 I stitch on 25 ct evenweave. 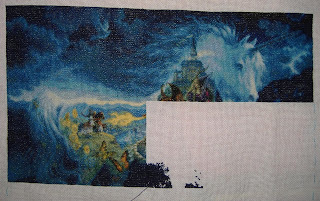 Below are the pictures of my progress !! I will probably not be able to do a lot of stitching in the coming weeks because we are moving in our new flat next weekend. I don't know when I'll get my internet access back but I hope it won't be too long. Now it's time for me to go finish our boxes ! Another update pic of Daisy Offerings & Info. Progress Pic as of May 19th. I am still on Page 2 out of 36 Pages. 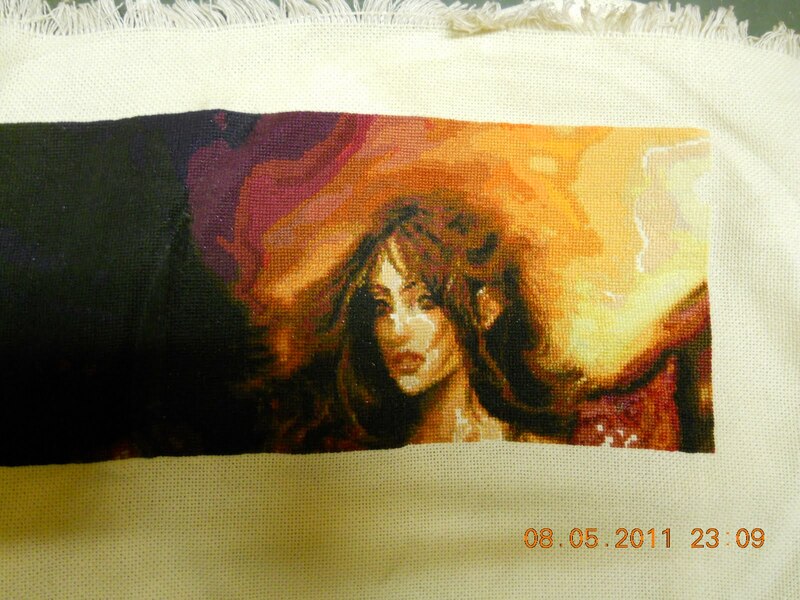 Stitching this on 25 Count Lugana Potato using DMC Threads 1 over 1. I am at my half way point now on Page 2. 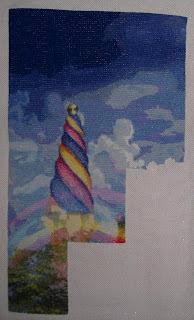 I introduce you to Linda Klinedinst, my new buddy (http://lindakscreativityworks.blogspot.com/). She is stitching on “Daisy Offerings” designed by Sandra Kuck. 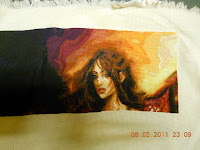 She is working on, 25 Count Lugana Potato, 1 over 1 with DMC threads. Her work was started on February of this year, and you can see her progress on the next photos. I'm back and doing fine after the operation.... thanks to everyone who wished me well! I managed no stitching at all in the hospital but am back on the horse now and two more pages are done on Faces of Faery 141, only three partial pages to go!!! Going to keep on stitching her until she is finished now and then I'm going to finish TT A Pale Comparison to get them out of the way ready for the reward program before going back to Emerald Dragon and Faerie Melody. Another page done. Some more background but I like the shading and the different blues. I am making progress with "Humble Adobe". I find it easier to stitch on 28ct Lagana. The size will be 56"h by 40"w when I am finished with the design. I switched from 25 ct to 28 ct for this design, "Humble Adobe" because my eyes were getting too tired to stitch on 25 ct. After a month of stitching and debating what to do, I thought I would start over and try 28ct even though it will be large! I am hoping that I can stay with the design to finish it. She is a pleasure to stitch. The colors are wonderful and stitching the face goes quite fast, not a lot of confetti except for her eyes. The 5th page is almost finished. There are 12 pages in total (3 partials). I haven't posted here for a while so, since I've been stitching on Dragon Fae for a little bit, this past week, I decided to share with you my small progress, I intend to return to it as soon as I finish some other stitches I have to do, so I hope I'll have another update still during this month. I'm tent stitching the background and doing full cross stitches for the dragon and for the fairy, I know there's not much to see yet but The horn of the dragon is already showing and I think that you can see the fairy wing already gaining shape. Page seven of the Unicorn is complete! And since six out of the eight remaining pages are partial pages, I think I'm officially done with more than half of it! As usual, I've let it rest for a week. 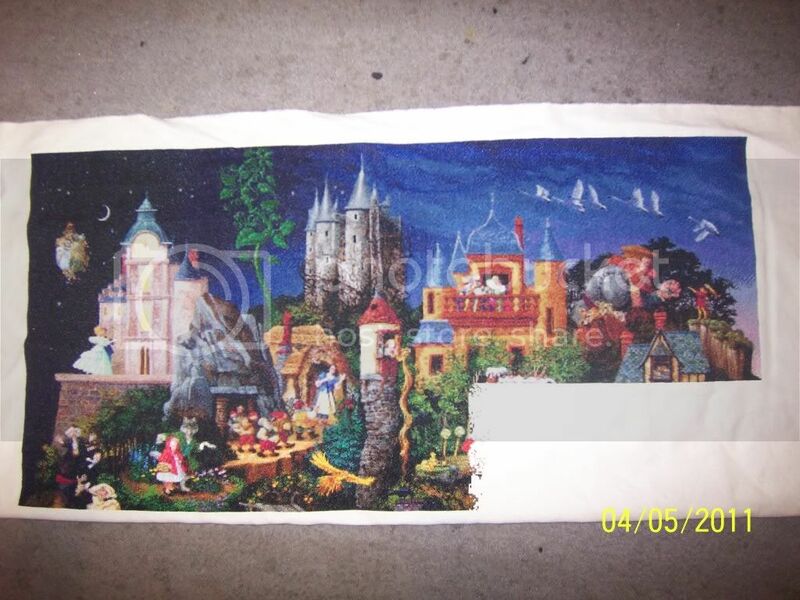 There's not much left from Gaudí's 9th page, just a tiny bit of cloud, and the roof of the house! With a little bit of luck this page will be complete by next week! 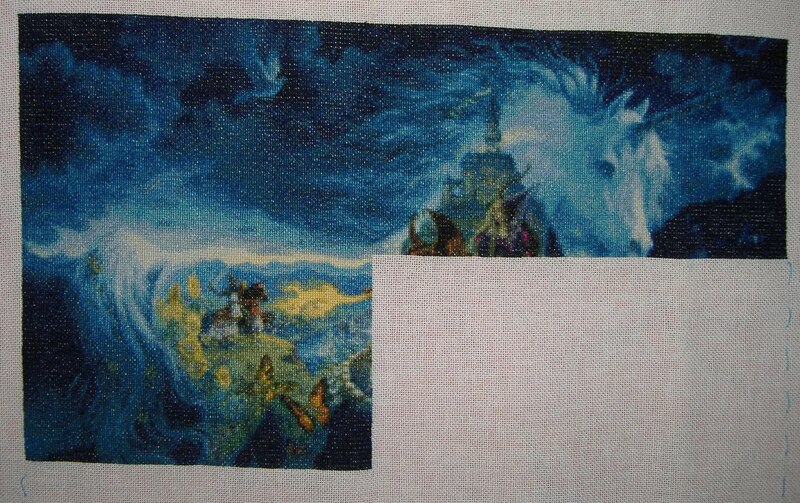 I am nearly done (maybe 25 stitches away) from being done with page 3 of Dragon Lady (exept for the two colors I forgot to order). 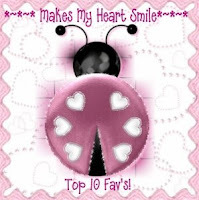 As usual I'm starting by thanking Susan for putting my update up for me, thank you Susan! 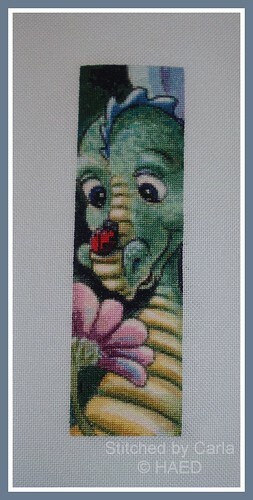 Dragon Rider by Randal Spangler, stitched 1 over 1 in full crosses on 25 count evenweave. 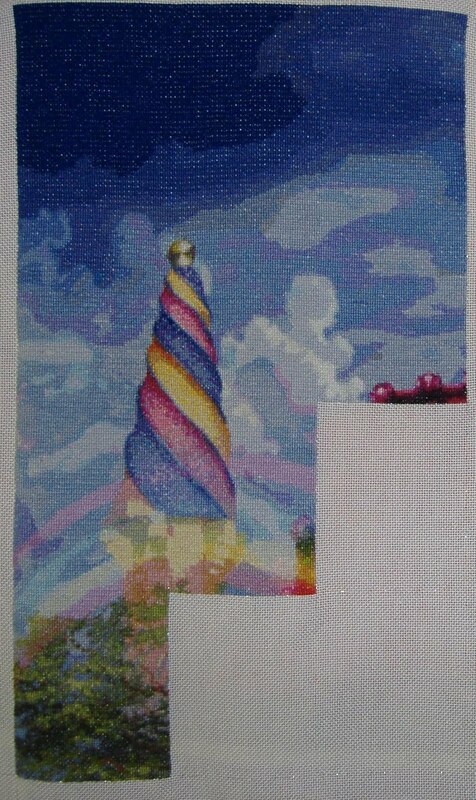 Hi All, Here my update on Faery Tales and I have finally reached the start of Gretel which is the red bit near the bottom.